We just heard the next greatest announcement from Google a few weeks back. It was none other than the announcement for the Android M, the next version of Android which will succeed Android L 5.1. Now Android M did not bring any ground breaking UI changes but is still based on the clean and clear material UI but it brings a lot of under the hood improvements including better speeds, process management, memory management, better Google Now integration and support for your SD card to become your default storage and also comes with revolutionary screen based fingerprint authentication support, but is albeit subject to the hardware available. Soon after the launch Google made the Android M developer preview available for Nexus users worldwide. It is one of the perks of owning a nexus device, that you get all the latest and greatest directly from Google. 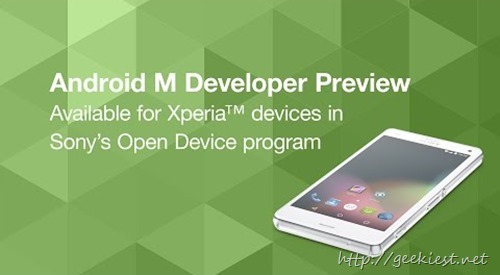 Now only Nexus users were able to enjoy Android M, but in a sudden turn of events Sony users can get to taste AOSP based Android M firm-wares. Yes you heard it right, it is not even Motorola but Sony. Of course Samsung users can just keep hoping they (pun intended). AOSP stands for Android Open Source Project and sony creates its ROMs based on these images. You can read the announcement here from Sony. Even the low end E3 is supported. Also Sony has said it cannot be used as daily driver which means that, it cannot be used for day to day operations. Camera and modem are not implemented so no Wifi and no Telephone calls. Also this is an AOSP stock build meaning the extra UI, XLoud, Bravia Engine etc are not implemented yet. If you try it out, be sure to comment.